Cook the rice and fluff it with a fork and spread it in a plate. You can used left over cooked rice too. 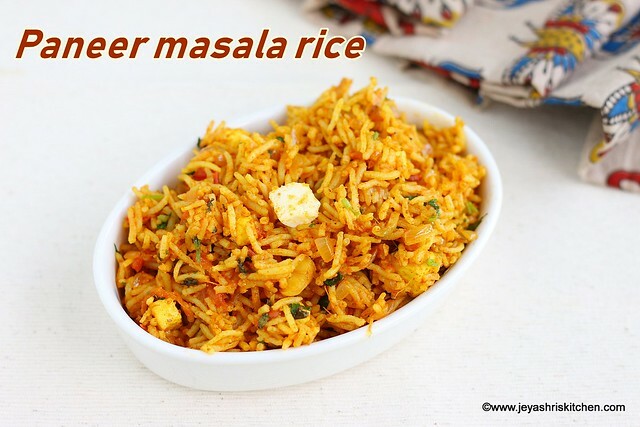 Check my recipe on how to cook basmati rice for more details. I chopped the paneer into small cubes. You can make it into desirable cubes. In a pan add oil and add the ginger garlic paste. Saute in a low flame for a minute. Add the chopped tomatoes and cook for a minute. Add the red chili powder, cumin powder, coriander powder, garam masala and salt. Mix well and cook till the tomatoes become mushy and the raw smell of the powders go off. Add the paneer to this now and gently mix it. You can add frozen green peas too. Add the kasoori methi to this. Let this be in the flame for 2 minutes. 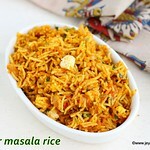 Paneer masala rice is ready to serve or you can pack for lunch box too. 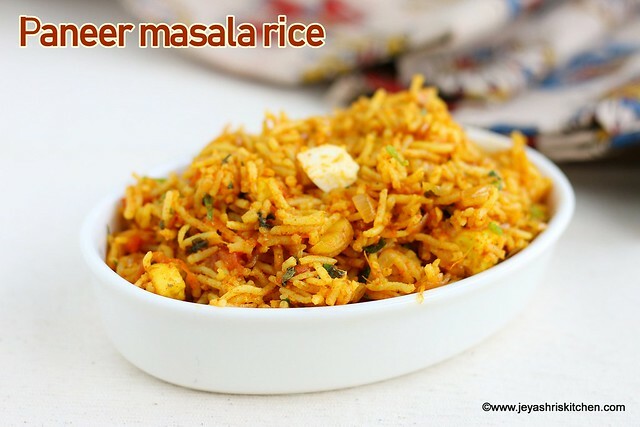 You can add some green peas and capsicum to the rice to make it more flavourful. Paneer cubes can be sauted in oil before adding to the masala rice.